J. K. Rowling. Rowling, JK, photograph. David Cheskin / EPA / Landov. J. K. Rowling is widely acclaimed for her novels depicting the adventures of the beloved character Harry Potter, a brave young wizard. She caused a sensation with her first book, Harry Potter and the Philosopher’s Stone (1997), which sold out of its first edition quickly and has been reprinted many times. The first Harry Potter book established a firm reputation for Rowling, both within literary circles and in the minds of the reading public. With seven Harry Potter books appearing in sixty-three languages, Rowling is one of the best-loved and most-read contemporary authors. Childhood in the Countryside. Joanne Rowling was born on July 31, 1965, in Chipping Sodbury, in Southwest England. She grew up with a younger sister and a distinct inclination toward storytelling. Rabbits played a large part in her early tales, for Rowling and her sister badly wanted a rabbit. Her first story, at age five or six, involved a rabbit dubbed, quite logically, Rabbit, who got the measles and visited his friend, a giant bee named Miss Bee. Two moves took the Rowling family to the town of Tutshill near Chepstow in the Forest of Dean along the border of England and Wales. This brought a long-time country-living dream to fruition for Rowling’s parents, both Londoners, and the nine-year-old Rowling learned to love the countryside in this new abode. She and her sister could wander unsupervised amid the fields and play along the River Wye. From Tutshill Primary, Rowling went to Wyedean Comprehensive School. Rowling confided to Roxanne Feldman in an interview in School Library Journal that the character of Harry’s friend Hermione is loosely based on herself at age eleven. English was her favorite subject. She created serial stories for her friends at lunchtime, and writing became more a compulsion and less of a hobby in her teenage years. Harry Potter Brings Success. 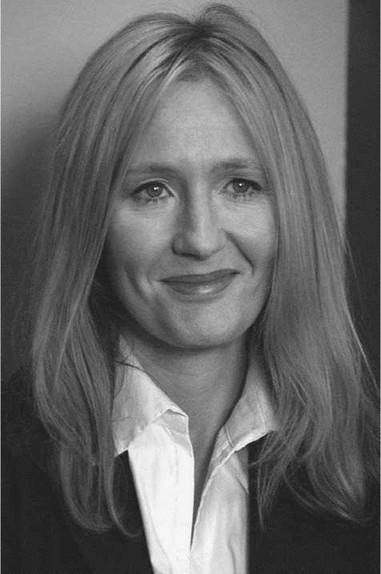 In late 1994, Rowling returned to the United Kingdom with her daughter and settled in Edinburgh. Unemployed and poor, the single mother used this time to complete her first novel, working on the manuscript in local coffee shops. Rowling sent her manuscript to several publishers before Bloomsbury published Harry Potter and the Philosopher’s Stone in 1997. Even before its British release, publishers in the United States were vying for rights to the book. Scholastic won the bid, paying one hundred thousand dollars, the most ever for a first novel by a children’s book author. Harry Potter and the Philosopher’s Stone (released as Harry Potter and the Sorcerer’s Stone in the United States) rose to the top of the children’s best-seller lists in 1998 and was later made into a popular movie. Its sequel, Harry Potter and the Chamber of Secrets (1998), went to the top of the adult best-seller lists in England shortly after its release, and consumer demand in the United States for the book ushered in a new era in Internet sales of books internationally, fueling concern over publishing rights. Rowling continued her saga of seven Harry Potter books, spinning a magical blend of wit and fantasy. From Rags to Riches. Rowling has won numerous awards and is now employed full-time in her life’s ambition as a writer, earning an estimated $1 billion for her stories about the boy wizard. Rowling remarried in 2001 and now lives in a mansion in Scotland with her husband and three children. Vladimir Putin (1952-): This Russian politician succeeded Boris Yeltsin and served as second president of the Russian Federation from 2000 until 2008. George W. Bush (1946-): This Republican politician served as the forty-sixth governor of Texas and the forty- third president of the United States. Stephen King (1947-): An immensely popular American author of horror fiction who blends elements of the traditional gothic tale with those of the modern psychological thriller, detective, and science fiction genres. Orhan Pamuk (1952-): This Turkish author was awarded the Nobel Prize in Literature for his writings, which explore tension between the Eastern and Western worlds. Rowling’s work follows a long tradition in literature that uses fantasy worlds to explore morality and human frailty in real life. Perhaps the archetypal novel for the negotiation of morality in the realm of fantasy is Miguel de Cervantes’s Don Quixote, while more recent examples would include the fiction of authors ranging from Isaac Asimov and Ursula Le Guin to Kurt Vonnegut. Accordingly, it is through the adventures of a romantic hero, Harry Potter, who is caught in the conflicts between good and evil, that Rowling expresses her views on morality in a sociocultural context. In explaining the nearly universal appeal of Rowling’s books, critics cite common archetypal themes. Harry Potter is a young version of the classic romantic hero. He is an orphan who has led a miserable life with the Dursley family, his maternal aunt and uncle. Ever since Harry arrived unannounced at their doorstep, the Dursleys have been put out, as has their vile son, Dudley. Harry has taken up residence in a broom closet under the stairs, been bullied at school, and mistreated by the Dursleys. Small, skinny, and bespectacled, Harry is an unlikely hero. The only thing physically interesting about Harry is the lightning-shaped scar on his forehead. In each novel Harry faces a quest, although the quest often reveals itself slowly throughout the course of the book. Harry encounters adversaries and helpers along his way—some human and some magical. While he is at times outsmarted, he rarely fails to rebound and is consistently aided by his friends, Ron Weasley and Hermione Granger. Some critics have asserted that the books are formulaic because of these basic and universal themes, but Rowling’s writing style and imaginative plot twists have maintained readers’ interest. The History of Rasselas, Prince of Abissinia (1759), a novella by Samuel Johnson. In this novella, an adventurous prince sets off with his sister and an adviser in search of happiness. From the first volume, critics have been nearly unanimous in their praise of the Harry Potter books. With each subsequent novel, and concurrent with the aging process for the main characters, Rowling’s themes have become darker and her plots more challenging to follow. Intricate plotlines and more mature subject matter parallel the growing complexity of Harry and his relationships with friends as they move through adolescence toward adulthood. Harry Potter and the Philosopher’s Stone. Most critics have been approving of Rowling’s novels. According to Contemporary Authors, Amanda Craig from New Statesman ‘‘loved’’ the first Harry Potter book and hailed Rowling’s tale as full of‘‘zest and brio.’’ Lee Siegel of the New Republic found the book appealing because of Rowling’s ‘‘wholehearted absorption in her universe.’’ Siegel also praised Rowling’s characterization, noting, ‘‘Harry and his friends Hermione and Ron Weasley are good kids, but they are not innocent, Wordsworthian kids. They usually do the right thing, and they always feel bad when they do the wrong thing.’’ Other critics believe the appeal lies in the rich imaginary world that Rowling creates. As the children of this generation read these books with fascination and love, they will pass the stories on to their children. 1. Compare and contrast the nonmagical human Muggles and the magical members of Hogwarts School in Harry Potter and the Philosopher’s Stone. What role do the similarities and difference between these two worlds play in furthering the novel’s themes? 2. Recall the role of the Sorting Hat in Harry Potter and the Philosopher’s Stone. What do you learn about Harry during his encounter with it? Support your conclusions with evidence from the text. 3. Discuss the prejudice against the members of the house of Slytherin in Harry Potter and the Chamber of Secrets. What problems does this prejudice cause, and why? 4. Many of the characters in the Harry Potter series have names that seem to describe their personalities in some way. Make a list of ten names you think are especially fitting for their characters and, using examples from the texts, explain how you made your choices. Now make up a name for yourself. Explain the process you went through to choose the name and why it fits you. Bierman, Valerie. ‘‘Working from Home.’’ Carousel (Summer 1998): 23. Feldman, Roxanne. ‘‘The Truth about Harry.’’ School Library Journal (September 1999): 137-39. Gray, Paul. ‘‘Wild About Harry.’’ Time (1999): 67-72. Maguire, Gregory. ‘‘Lord of the Golden Snitch.’’ New York Times Book Review (September 5, 1999): 12. Maslin, Janet. ‘‘At Last, The Wizard Gets Back to School.’’ New York Times (July 10, 2000): B1-B6. Power, Carla. ‘‘A Literary Sorceress.’’ Newsweek (December 7, 1998): 79. Turton, Rayma. ‘‘Review of Harry Potter and the Philosopher’s Stone.’’ Magpies (March 1999). Winerip, Michael. ‘‘Review of Harry Potter and the Sorcerer’s Stone.’’ New York Times Book Review (February 14, 1999): 26.